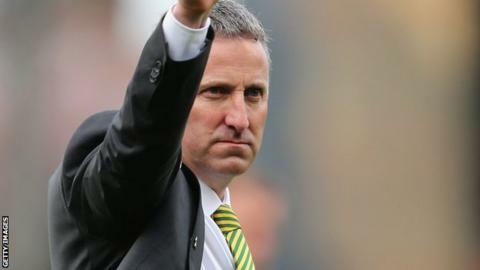 Norwich City defender Michael Turner has praised the approach of new boss Neil Adams since replacing Chris Hughton last week. The Canaries lost 1-0 to Fulham on Saturday and are two points above the Premier League relegation zone. But Turner told BBC Radio Norfolk: "He's told us we can believe in ourselves a little bit more. "He's told us we are good a team and good players and we really shouldn't be in this position." Norwich saw more of the ball and created more chances than their opponents at the weekend, but their failures in front of goal continued as they went a third consecutive game without scoring. The Cottagers occupy the final relegation spot and are one place behind the Canaries, who have an unenviable run-in of Liverpool, Manchester United, Chelsea and Arsenal in their last four games. Hughton was sacked last Sunday following a home defeat by West Brom and former midfielder Adams had just five days to prepare his side for the trip to west London. "He's put across some good points that the lads have bought in to," added Turner, who played his first game since January at the weekend after a hamstring injury. "I think with another week behind us we can improve still and take it into the next game. "People have written us off, so we can go into the games and leave nothing behind. "In the past we've played against some of the top teams and done well, so there's no reason why we can't do it again."